Today’s cartoons are quite a mixed bag, featuring one more on BASKETBALL, one more on WINTER, plus a GOVERNMENT toon — not necessarily in this order. 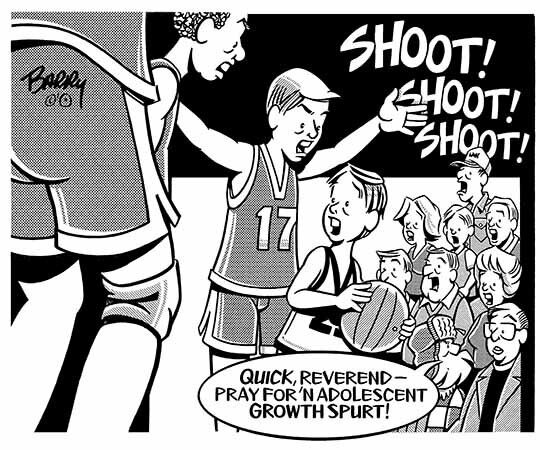 1) GROWTH SPURT ~ This will be my last school BASKETBALL toon for the year, since the regular season is about to wrap up. I’m not including any post-season options this time, figuring that what I’m attaching herewith will run well for all BB games whenever they’re played. 2) GOVT. 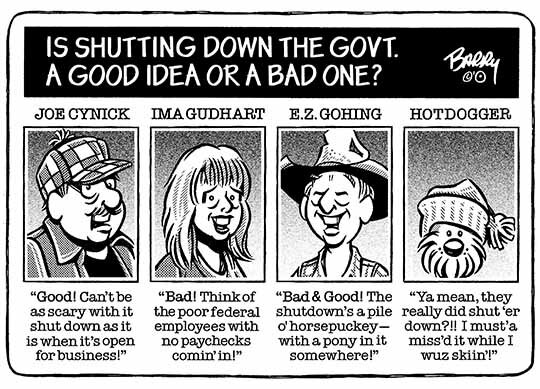 SHUTDOWN ~ Given that the most recent SHUTDOWN ended just a couple of weeks ago, & given the predictable threats of another en route, it seems like a swell time to send you this toon. In it, once again I’m interviewing folks around town & offering my readers their opinions. Hopefully, I’ve presented an across-the-board range of views. Surely, your readers will find one, at least, that they can readily identify with, eh? 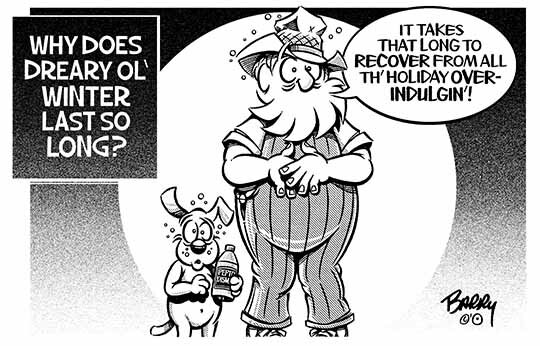 3) OVERINDULGIN’ ~ In this cartoon I’m bidding a final farewell to Holidays gluttony, which is still recent enough in most local minds for the toon to stir up memories — be they fond memories or of the regretful variety. The toon also falls within the province of "winter wrap-up." BTW: It’s been a tough week here in several departments. To top things off, last night while finishing this set of toons my pipes froze up. WHAT — NO WATER??? UGH! In short, I won’t have today's toons posted to my online Toon Categories till a bit later today — though, the toon links below are operational now, all set for you to access. I’m gonna think positive & assume this winter’s BIG chills are about spent, with no others due to show up on our respective radars. So, as tempted as I am to cartoon next about frozen pipes, I’ll hold off till the winter of 2019/2020. Yep, I’ll stick my current plumbing frustration into my pocket for now — but, you can bet your bippie I won’t forget where the toon inspiration came from when the time to cartoon it rolls around. HA!